Tom went to Carl Sandburg High School in Orland Park, Illinois and that’s when he first became interested in coaching. He participated in football, wrestling and baseball at Carl Sandburg. After graduating from high school he went to Joliet Junior College. He became a Junior College All-American in wrestling and the team finished 2nd in the nation. He then was awarded a full wrestling scholarship to the University of Texas at El Paso. UTEP unfortunately dropped wrestling and University of Arizona head wrestling coach Bill Nelson brought Tom to the U of A to finish his wrestling career. He finished his degree in Education earning degrees in Physical Education, Health Education and Driver Education in 1971. After college Tom taught and coached for 31 years at Apollo Jr. High (Sunnyside District), and TUSD high schools Rincon and Sahuaro. Tom is still coaching, assisting with football and wrestling at Sahuaro. As a freshman football coach he has over 200 plus wins. As a head wrestling coach, beginning in 1976 at Sahuaro, his teams won over 100 dual meets and won many tournaments including the Flowing Wells, William Bell, Douglas, Mountain View, and many regional tournaments. He had many wrestlers place at the Regional and State levels. He served as Athletic Director at Sahuaro in 1990. 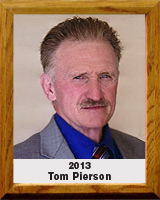 Tom helped Coach Al Sye organize the Pima County Sports Hall of Fame in 1989. In 2008, he was inducted into the Sahuaro High School’s Athletic Hall of Fame. In 2011, he was named a high school signature coach by Coaches for Charity during its annual High School Football Kickoff Classic festivities.